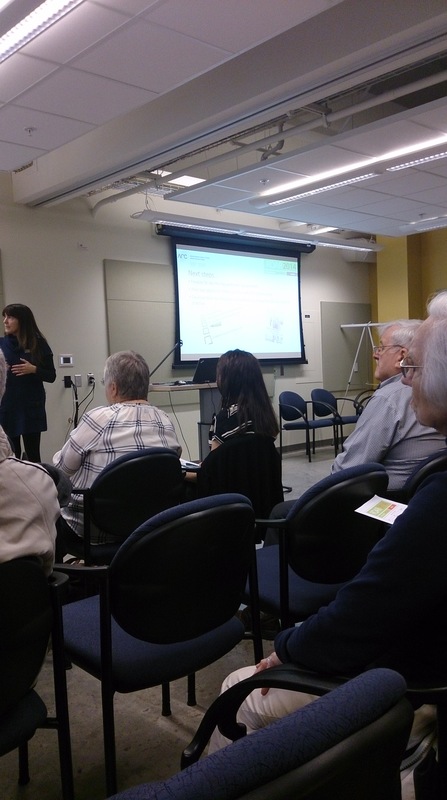 I had the pleasure of attending a recent event sponsored by the Arthritis Research Centre of Canada called ROAR, (Reaching Out with Arthritis Research), a public forum hosted by researchers, scientists, physicians, physiotherapists and occupational therapists offering a glimpse into the progress of ongoing research and new advances in the battle against arthritis. It’s a fabulous way to connect with others in the community, to learn about the various types of arthritis, ask questions and have your say about what you’d like to see in future research. If you can’t be there in person, they offer a webcast for you to participate in from the comfort of home. This event has been going on for the last several years, and I was fortunate enough to finally attend for the first time. It was not for lack of interest that I did not attend previous years, but simply for lack of timing. Several topics were covered in a short three hours – everything from new web applications and bone studies in early RA to quality of care for hip and knee replacements, and the impact of arthritis on self-identity; there was even an amazing art presentation from a patient who had been battling RA since childhood. I was a participant in one of the projects discussed and I was interested in hearing about the early results of that particular study. At 9:30 am, we were greeted and given a registration package outlining the talks for the morning. We chatted with others, read biographies, and reviewed evaluations forms on the event. Our first talk started at 10:00 am with a Physical Therapy Teaching Supervisor discussing her research on bringing in new standards of quality care after joint replacement. This was directed more towards OA rather than RA. RA and other inflammatory arthritis would have more comprehensive standards due to multiple joint involvement, and therefore, would be have to be a separate study. The Well in Hand Study measured changes in bone health and reduction of bone density in patients with early RA compared to their healthy peers. This was the project in which I had a hand in participating (no pun intended). I wasn’t too surprised to learn that in early RA damage takes place in the first six months – I was surprised to learn after a year’s time there was very little to no change, likely due to treatment. They conducted this study by having us wear activity monitors and taking images with a high resolution CT scan of the hand and forearm every six months. They also looked at the relationship of physical activity versus being inactive and how it can help prevent early bone damage. In a study called Changing Shoes, the impact of arthritis on self-identity was examined. There’s no denying that with the onset of disease comes lifestyle changes. In changing their shoes, women find new roles in the face of arthritis. (We can apply the same metaphor to lifestyle changes in men, without the analogy of high heels). Web applications have a come a long way in helping us manage disease. We can track heartbeat, activity, and blood flow, all through apps and monitors on the computer. Technology is constantly evolving and tools are being developed to help scientists and physicians monitor disease activity and symptoms. This presentation centred on the new online devices and how they help improve quality of life in patients. There was an introduction to the often mysterious and misunderstood Raynaud’s phenomena, with tips on how not to fall victim to the fluctuating temperatures of life. Informative facts from a dermatologist and pointers from a Raynaud’s patient on daily life. 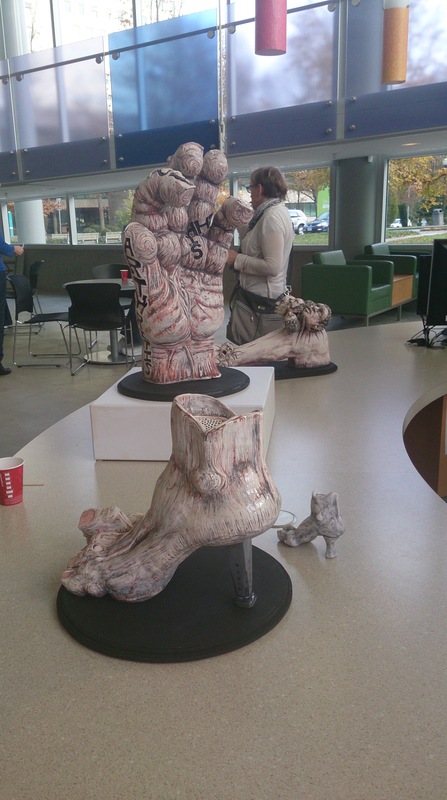 After the discussions, we were given a break to learn some stretching exercises from a physiotherapist and view the beautifully twisted ceramics of an RA patient expressing his pain through clay. This event helps our research scientists shape the direction of future investigations. Being a participant in research can help empower patients, teaching them new techniques on how to self-manage. Along the way, we have the opportunity to meet inspiring people, and connect with others for extra support. Together we can find a way to abolish this thieving disease and plant the seeds of hope to rebuild the strength to take back our lives. I find it no coincidence that the acronym ROAR, is also the marketing term used for our local football team The B.C. Lions. Many of us will never be football players, but arthritis patients can certainly roar with the best of them. 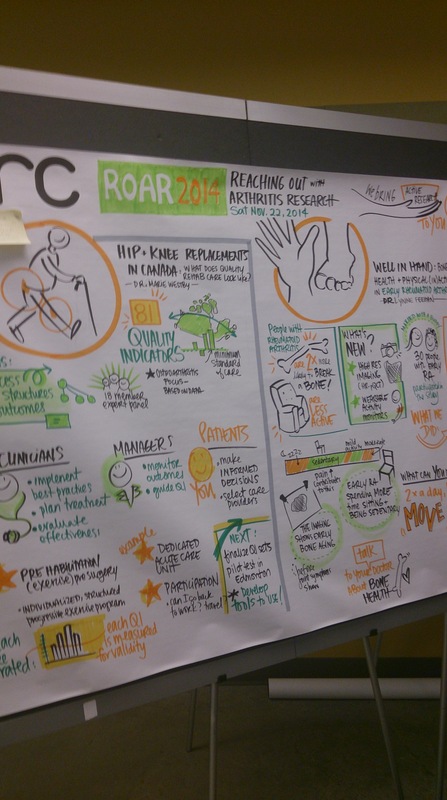 To learn more about the projects discussed in this year’s ROAR event and other ongoing research, please visit: The Arthritis Research Centre of Canada. What a wonderful conference! You were so fortunate to attend. Thanks for sharing! Hi Carla, it was a wonderful morning learning about the research in progress. Hope you are doing well. Cheers. J.G. I was surprised that you were only diagnosed about 3 years ago and that you have such severe flaring. I too this winter and having a difficult time, I was diagnose with CPPD about 2 years ago and after any exercise I don’t seem to recover. But we march on! Yes, I was diagnosed almost four years ago now…feels like a lot longer 🙂 This past year has seen a lot of victories and defeats but I am marching on. Thanks for stopping by and hope you are staying well. Cheers. Thanks Irma, I hope you are improving each day. Yes, RA certainly got my hands but I’m learning some OT tricks to help reduce the pressure, and trying some exercises. I hope to keep them moving for a long time. Stay well.